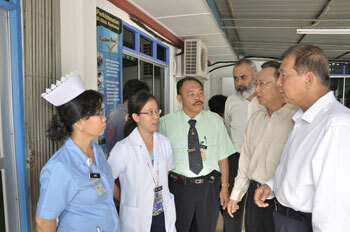 CONCERN: (From right) Ting, Chia and Karambir listen attentively to an impromptu briefing by Dr Polly (second left) and senior staff of the polyclinic. MIRI: Continuous efforts are being taken to upgrade the existing facilities at the congested Miri Polyclinic located at Jalan Setia Raja here. The medical officer in-charge of the clinic, Dr Polly Edward said among efforts to be taken are the purchasing of six to seven units of air-conditioners for the patients’ waiting room, the treatment room and x-ray room. Dr Polly also said that political secretary to the Minister of Energy, Green Technology and Water, Datuk Sebastian Ting who paid a visit to the polyclinic yesterday that the computerisation of services including the call system for patients was also being worked out. As for the acute problem of parking for both staff and patients, the Land and Survey Department had agreed to allocate the land behind the clinic for the said purpose. On the average, the clinic provides treatment to 500 to 700 patients daily and out of the number over 100 of them are diabetics. Meanwhile, Ting said that he and Datuk Seri Peter Chin would strive to facilitate efforts so that the urgently required facilities for the polyclinic could be acquired speedily. Ting was accompanied during the visit by former assemblyman for Pujut Andy Chia and the assistant secretary general of Sarawak United People’s Party Karambir Singh. The visit was made to enable Ting gain first hand knowledge on the clinic’s condition including efforts to provide quality services to the people.